The cherry blossoms are running late. They're taking forever to emerge from the naked branches of Japan's beloved yoshino cherry trees. The sun is out and the weather is warm and the audience is assembled, but like tardy brides, the blossoms are keeping the anxious crowd waiting. It suits me just fine. 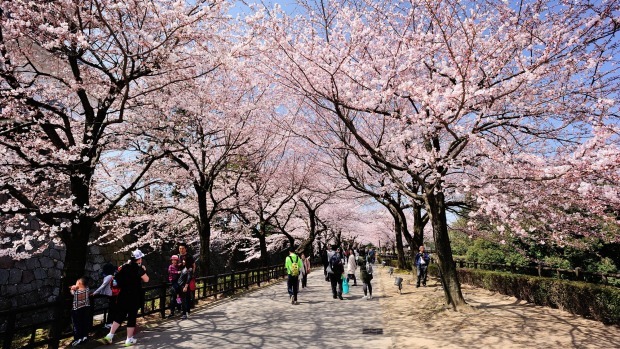 I've arrived in Japan at what should be the tail-end of the cherry blossom season, and my only hope is that I might see some confirmation of this fleeting majesty – petals withering in the gutter, perhaps, or the last buds falling mournfully from the trees. But the weather bureau's cherry blossom forecast can never predict the precise moment the blooms will emerge. Perhaps this explains their allure, for an encounter with the blossoms feels providential, like a blessing from an animate being. 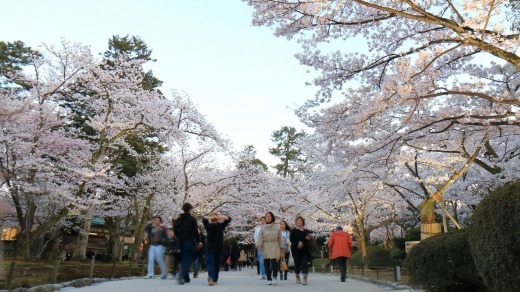 Even the Japanese, who are showered with petals each spring, must jostle for space beneath frothy canopies in order to enjoy hanami, a ritual delight-taking in the beauty and transience of cherry blossom season. So the buds are late but I'm right on time and our schedules are happily colliding. In Tokyo, they amass on the branches like butterflies, aflutter with the least breath of wind. In the countryside, they bubble out from the deadwood, heralding my timely arrival: they have heard the oncoming rumble of the shinkansen as we bullet northwards, and have opened their pink arms in welcome. By the time we reach Kanazawa, they are positively showing off, dripping from trees, clouding the skyline, doming the streets in florescence. "Two days ago, there were none," marvels Simon Rickard, professional gardener and one of our Botanica guides. Such is the capriciousness of cherry blossoms: they will arrive when they are ready. This doesn't deter couples engaged-to-be-married, who are posing for matrimonial portraits at Kenroku-en Garden, though their weddings are still months away. 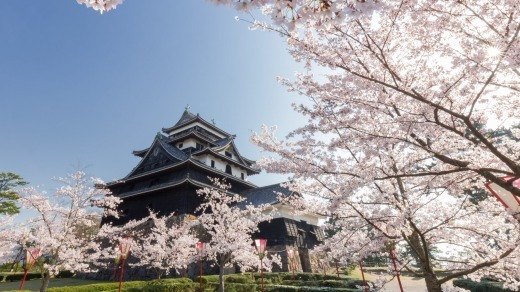 Such a response to this spectacle is inevitable, for the revered yoshino blossom – a cluster of five barely pink petals, each one notched at its apex – casts a magical spell. It represents at once the beauty of youth, the fragility of life and the impermanence of time. But even as new life and young love flourish around us, old age is being celebrated. Rickard leads us to Kasumigaike Pond, where the ancient Karasaki pine, slumped with age, is being upheld by wooden poles. "The Japanese prop up their old trees," Rickard explains. "They venerate old age." This reconciliation between rebirth and decline is apparent all along the coastline as we cruise from Kanazawa to Matsue, where the last of the almond-scented apricot blossoms are falling to the ground, where the Japanese maples are coming into bud and the weeping cherries are in full bloom. At Hagi, wild cherry trees flush the mountainsides pink. People come early to lay their tarpaulins beneath the vaporous blossom-mantles in Shizuki Park. Later, they'll picnic with their families amid a flurry of whisper-soft petals. We arrive before the crowds, too, at Tokoji Temple, and roam paths slick with camellia buds and moss. It's a little bit sad and lonely, Rickard says, compared with the crisp, clipped, weeded gardens we've visited in the past few days. A little bit wabi-sabi – that ancient Japanese celebration of rusticity and transience and the patina of age. Wabi-sabi has set in across the Korea Strait in South Korea, too, where the cherry blossoms – planted by the occupying Japanese in the early 20th century – are beginning to wilt. A breeze rattles the trees, launching petals into the air like a plume of pink smoke. But at Gyeongju, the crepe myrtles are being primed for imminent rebirth: women balance on crates and scrub the tough bark until it shines. 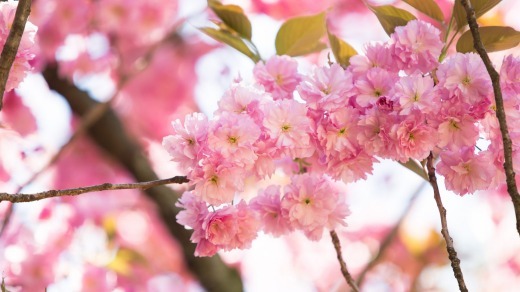 Their flowers are more durable than those fickle cherry blossoms, too: clinging steadfastly to the branches, they will bloom for a full three months. We sail back across the strait to Nagasaki, where the cherry blossoms tell another story, one of revival and resilience. Just months after this city was annihilated by an atom bomb in 1945, much of its flora started sprouting again, says local guide Miyuki Ogawa. And this fledgling growth was supplemented by still more plantings: 1000 cherry saplings alone were embedded in the charred earth by the doctor who devoted his life to researching the bomb's effects on this city's residents, Ogawa says. We wander up to Glover Garden and look back at the rebuilt skyline from this elevated, fecund place: it's a view filled with creepers and bright annuals and agave – and those cherry blossoms, framing Nagasaki in a halo of light. We cruise around the south-western end of Kyushu to the UNESCO World Heritage-listed Yakushima Island, with its old growth forest; to Miyajima, whose famous vermillion Torii gate is backlit by a luminous spray of cherry blossoms; and to Hiroshima, where nature prevailed, too, following the atomic bomb attack of 1945. The survivors were told it would be 75 years before the radioactive residue made way for new plant-life, guide Mitsu Nagao says. "It's been 72 years, and you see?" she says, pointing skywards. "The trees are already age-old." Pondering this rebirth, we sail past the islands of the Seto Inland Sea to Takamatsu, on Shikoku Island, where the hillsides are a tangle of cherry-pink and maple-green. At Ritsurin Garden, another betrothed couple are posing for photographs ahead of their wedding day. The groom wears a snow-white kimono; the bride has purple thistle and yellow marigolds pinned into her jet-black hair. But the backdrop to their portrait of young love and new beginnings is a copse of yoshino cherry trees whose blossoms have begun to wither. They fall from the branches in a blizzard of pink, and carpet the damp earth like snowfall. There is something wabi-sabi about this scene, as Rickard might say; something a little bit sad and lonely in these blossoms that have peaked and then troughed far too swiftly. Catherine Marshall was a guest of Botanica. Summer ends in a blaze of glory in New England in the US, when the leaves of deciduous trees – sumac, dogwood, maple, birch – transform from green to yellow, orange, purple and scarlet. This fleeting display – nature's fickle artwork – is best enjoyed during a road trip (but remember to keep your eyes on that road). It's a rare occurrence and one that can't be predicted, for the wildflowers of Chile's parched Atacama Desert only emerge after unforeseen bursts of rainfall. Wildflower seeds germinate beneath the sudden deluge and the once-arid plains erupt in rainbow splashes known colloquially as "desierto florido" (flowering desert). For a few weeks between March and April each year the Sultanate of Oman, a swathe of mountainous desert stretching across the south-eastern Arabian Peninsula, is infused with the intoxicating scent of roses. These blooms thrive on the country's temperate high plateaus, and their petals are harvested by villagers for the production of the country's prized rose oil, attar, which is used in perfumes and cooking. So ancient and unusual is southern Namibia's Quiver Tree Forest, it's listed as a national monument. The peculiar-looking plant thrives in hot, arid conditions, and is fact a type of aloe rather than a tree. Its name is derived from the quivers made by the San people from its smooth, primordial branches. Their yellow blooms – which appear for the first time at between 20 and 30 years of age – can be viewed in June and July each year. In springtime (between March and May), Holland's fields are quilted in colours so bright they're almost irreconcilable with nature. This is tulip season, and the most famous place to enjoy these quintessentially Dutch blooms is at Keukenhof Gardens in Lisse, southwest of Amsterdam. Around seven million bulbs are planted here each year, and though their unfurling is dependent on the weather, the best time to see them is usually around mid-April.